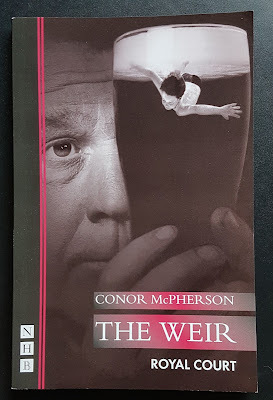 Connor McPherson is currently receiving huge plaudits for his West End hit, Girl from the North Country; a play that weaves the songs of Bob Dylan into a tale about the lives of several people living in a Minnesota guest house in the grip of the great depression of 1934. However, it’s always been his ability to tell a great ghost story that has made me admire his work. 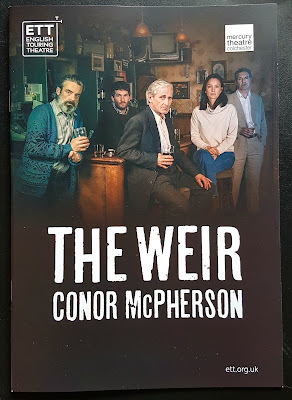 It is 20 years since The Weir made its debut at the Royal Court, but it is still a tale that haunts and enthrals its audience when it is told. I remember travelling around Southern Ireland about 20 years ago. I packed my little car (a blue Yugo called Fergus – very unreliable with only four gears, a tape player and windows that didn’t wind down) with no idea where I was going, or more importantly where I’d be spending each night. I would just drive and end up somewhere, usually on the outskirts of town, knocking on a B&B door hoping there would be room for me. It was in these smaller villages I’d go to the local pub, and around peat fires the locals would either be having a sing-song, or a telling a good yarn! What I love is the simplicity of the play. 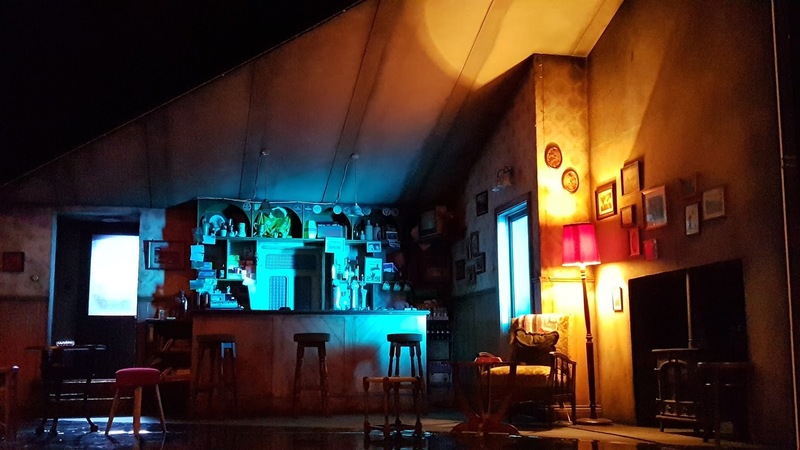 It is set in a small bar in the back of beyond (I love the small details in the set design, including the boxes of Tayto cheese and onion crisps!) Jack walks in and there is no one else there, so he goes behind the bar, helps himself to a beer and pops the money in the till. Only in your local bar would you feel comfortable doing that. And that’s what it is, a familiar place to go to, where you feel at home; a place of warmth and comfort if you’re feeling isolated and lonely. This rural pub is where the locals gather for a bit of companionship; to swap the stories of the day, to see a friendly and familiar face over a pint. They are so used to it just being themselves, barman Brendan ( Sam O’Mahony), mechanic Jack (Sean Murray) and Jim (John O’Dowd) that they’re aghast that local businessman, Finbar (Louis Dempsey) has taken it upon himself to show a newcomer from Dublin around, Valerie (Natalie Radmall-Quirke) and he’s even bringing her to their pub! This is ruinous to the natural order of things! At the start the boys don’t know how to act with Valerie. It’s obvious no women ever frequent the bar. A simple request for a glass of wine causes problems. Brendan goes to track a bottle down in the house; when he reappears, he pours the wine into an ordinary tumbler after a desperate search under the bar reveals no wine glasses! As the beer flows on a particularly windswept night, the boys relax and start swapping spooky tales, starting with strange goings on at the property Valerie’s renting. Tales of fairies, local stories and dead men appearing at gravesides start to grow darker and Finbar is worried the boys are scaring Valerie; but her story is far more unsettling than any of theirs. It would be easy to just dismiss The Weir as a play of several spooky stories, but it isn’t, there are hidden depths to each character. For all of their differences, these people are just normal folk. Each character, in their own way, is isolated and what starts as sharing stories to titillate the newcomer, end up with them all revealing their hidden anxieties and true natures. Ireland has always given rise to a great storyteller. We’ve all sat at home when the wind has played tricks on us, we’ve heard a noise and just for a second we’ve been too scared to move. We know there’s nothing…but what if? It’s part of being alive to wonder what happens when we’re dead, so if we can open up about that fear, why can’t we open up about the other fears we face. Why is one more tolerable than another? This revival by English Touring Theatre and Mercury Theatre Colchester has emotionally charged performances throughout; however, there are areas where its slow pace makes the night stretch a little too much. There are some beautiful lighter moments peppered throughout the play, but they get lost, almost glossed over. The most captivating parts of the play are when the characters are most out of their comfort zone. Jack, the quietest of the gang, taking centre stage to tell of his strange tale, and Finbar, the confident business man suddenly spooked as he turns back the hands of time in his mind. But the play is at its most poignant when Valerie finally opens up and finds herself no longer the outsider, but now bonded with the group. The Weir isn’t a bunch of ghostly tales whiling away an evening, but a play of bonding, of community, of the lonely and isolated. People held together with their sharing of stories, and maybe a drink or two!